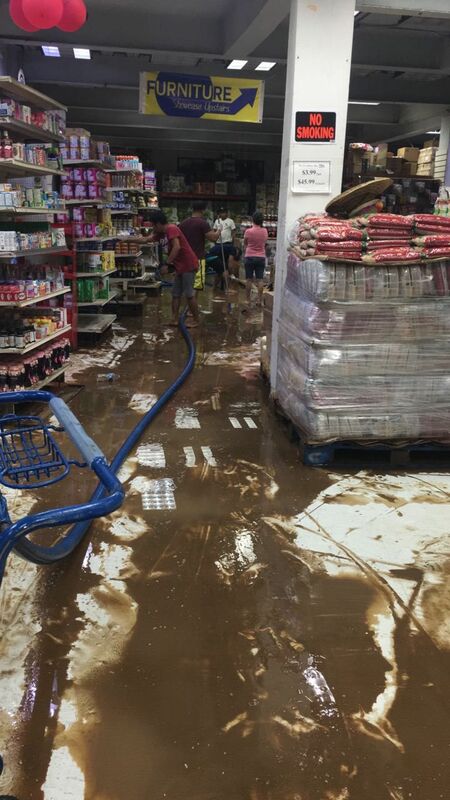 Many of the businesses from Fish Bay to Prospect Reef on Tortola, including Bars and Restaurants, Night Clubs, Car Dealerships, Churches, Commercial Buildings, Gas Stations, Malls, Insurances Businesses, food shops, Law Firms, Craft Alive, some three banks and even food vans have been flooded and damaged by the 24 hours of heavy rains. Many business owners spent today cleaning out their businesses. 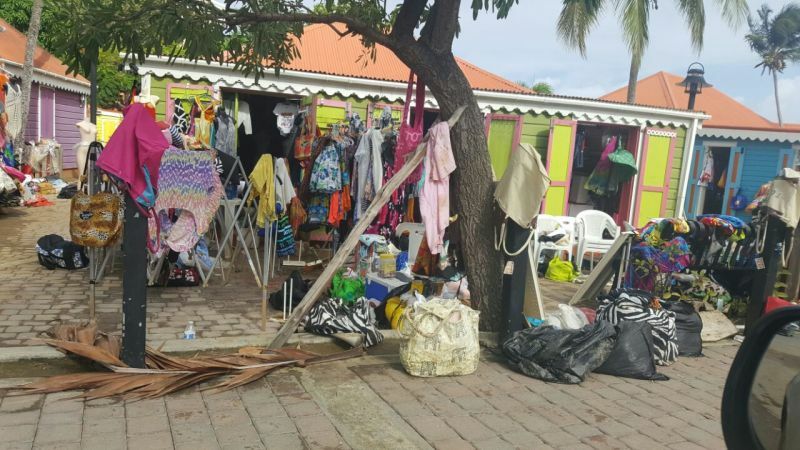 Meanwhile, many clothing stores in Road Town, owned by local Middle Eastern Residents, sold some of their stock items at a reduced rate that might have been damaged, as well as, some vendors at Craft Alive. In addition, other local businesses hired clearing crews to move stocks from ground floors and basements in an attempt to save them from being further damaged. While pumping out water, others had to solicit help from staff and even the Fire and Rescue Services to address their own severe flooding in some cases where files, chairs, papers and dry goods were affected. The losses of items by business owners are "real", one businessman speaking to our newsroom who did not want his name to be used said, and the "damage to Road Town businesses could be in the Millions”. 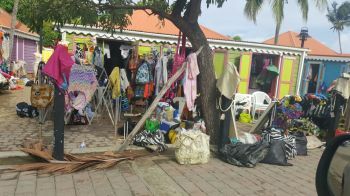 Items damaged includes, clothes, shoes, food stuffs, dry goods, tools, chairs, desks, computers, souvenirs, jewelries, bags, cosmetics and stationeries. Meanwhile, the East End Long Look Festival Sub-Committee has announced that all events scheduled for tonight Tuesday August 8, 2017 has been cancelled. However, they are expected to continue with the Wednesday morning Rise and Shine Tramp which is to get underway as early as 3:00 A.M. tomorrow morning Wednesday August 9, 2017. 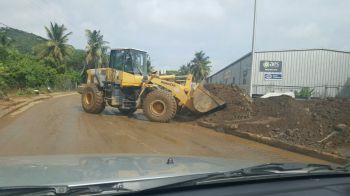 Public Works crew, as well as, private heavy equipment operators have been out cleaning roads and moving abandoned vehicles, mud, rocks, trees, garbage and other debris from roadways to allow traffic to flow, on Tortola and Virgin Gorda while the BVI Electricity Corporation has managed to restore power to at least 50 percent of residents and businesses. Water is still off in most parts on Tortola and Virgin Gorda, according to the state-owned Water and Sewerage Department. This is due to damaged water main lines and other technical issues. It is unclear when water, which has been a serious challenge before the weather situation, will be restored. Many residents still face flooding of homes, cars and boats and there have been confirmed reports to our newsroom of homelessness in about two communities of about less than ten residents. However, those in need have sought help from family and friends and have not relied on the State for shelter. Out of the four islands, Tortola has been hit the hardest, then Virgin Gorda, followed by Jost van Dyke. Anegada, although it experienced heavy rains, has remained relativity without any major damage. Premier Dr. the Honourable D. Orlando Smith (AL) has made appearances on one local AM Radio station. However, with power still off in some communities, his message was not heard in all areas of the Territory. Governor John S. Duncan OBE whereabouts is unknown, however, long-time public officer and Financial Services Commission boss Dr. Robert A. Mathavious has been named acting Governor and has been speaking to the public on the ongoing weather situation. According to the latest weather report from the BVI Disaster Management, the tropical wave and upper level low pressure system which affected the Territory on August 7 and 8, 2017, have moved away from the Territory. However, the Antigua and Barbuda Meteorological Service’s latest forecast model runs indicate that lingering atmospheric moisture across the Virgin Islands could still trigger some passing moderate showers across the islands tomorrow morning. As a result, there is a 20 percent or slight chance of showers tonight and a 50 percent or moderate chance of showers tomorrow, Wednesday August 9, 2017. This is craziness. Why on Gods earth in this time of national disaster, will EE/LL festival sub-committee still want to go ahead with a tramp. Do they not have any regards for some many who were affected. This kind of don't care attitude sends a bad message and the powers that be needs to step in now and stop this madness. Seems like only VINO taking this thing that hit us serious...Millions is joke, what about damages to homes and we have not even look at schools yet!!!! Hope the people have insurance. 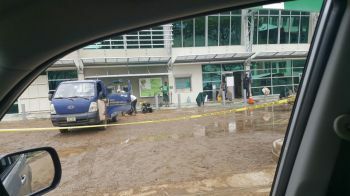 good time to get that 7 million dollars back from BVI AIRWAYS!!!!!!! Sadness and pain goes out to my parents' homeland-the Virgin Islands(UK)! We had similar rains here in the US Virgin Islands with no flooding whatsoever. Infrastructural development- proper drainage on the sides and under major highways is the reason. This is a very critical time for our government to realize that shoddy construction is no joke. Stop giving infrastructural contracts to neophytes and rookies because they're born here. Hire experts from wherever to tackle these problems! Allow some of your budding engineers to apprentice with Island Roads Corporation on St Thimas to learn the logistics of road building and let them come back home with proper skills to service the needs of this country! It rains in the Kingsom everyday! No flooding issues there-why here and we are an overseas territory. Let us get about the business of real "nation building" and get about the issues that truly sustains a nation- infrastructural development IN ALL ITS FORMS!